Fear not, little flock, for it is your Father's good pleasure to give you the kingdom (Luke 12:32). Jesus said unto the ruler of the synagogue, Fear not, only believe (Mark 5:36; Luke 8:49-50). Jesus said, Why are ye so fearful? How is it that ye have no faith? (Mark 4:40). The hairs of your head are all numbered; fear not therefore, ye are of more value than many sparrows (Luke 12:7). Fear not; I am the First and the Last.— Revelation i. 17. When we fell from Grace, we left the Garden of Truth and Love, turned our backs to God and chose to live by self-love and self-intelligence. Now, we think we are all alone against the world. And our personal identity (ego) desires to control circumstances and others to feel safe; it also craves security and approval. We are afraid because we have lost the Truth. If we remembered and understood the Truth, we would dissolve this existential fear. The Truth is that the universe is not just physical; it is higher-dimensional. And these higher dimensions are dimensions of mind and spirit. Our inner state of being is far more important than our outer circumstances. In fact, we can acquire the wealth and glory of the whole world and still be miserable. The only way to eliminate fear is by understanding Truth and practicing Love. We must turn around and face God again. When we surrender to Reality or Love, our fear dissolves. Like Light dispels darkness, Divine Truth/Love casts out all fear. We are afraid because we are fooled by appearances. If there were no spiritual world and no source of Infinite Good, we would have every reason to be afraid. But this is not the case. God [Infinite Being/Love] and Heaven are real; they are more real than the physical world. For example, when we are diagnosed with a disease or when we lose our fortune, we become fearful. And the last thing we need when these things happen is to descend into the pit of spiritual darkness. If we just stayed at the levels of spiritual Light, we would eventually heal physically and financially. By descending into spiritual darkness, we actually prevent our physical and financial healing. In the Bible, we hear about certain persons who found themselves in the most horrendous circumstances and yet emerged victorious because they trusted in God. For example, when Daniel refused to worship king Darius and continued to worship and pray to the One true God, he was placed in a den of lions. But, due to his true faith and lack of fear, he was left unharmed and went on to victory. 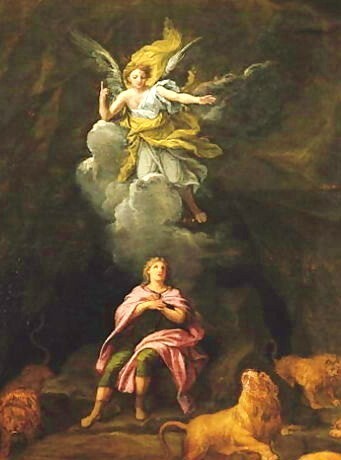 Most artists who illustrate this Bible story rightfully show Daniel turning away his attention from the voracious lions and lifting his eyes towards a ray of Light beaming into the cave. We can also interpret this literal story on the internal or psychological level. The Lions represent our wild or selfish passions and the ray of Light corresponds to God’s presence or Divine Truth and Love. When we tame the passions of self-love and transform them into neighborly and heavenly Love, then they can no longer devour our Life and we are safe. Joseph was sold into slavery by his jealous brothers. And, because of his faith in God, he eventually was freed and became advisor to the king of Egypt. When we descend into natural or worldly understanding, we become a slave to natural and sensual knowledge (Egypt). When Joseph was reunited with his brothers, he told them: "You thought you were doing me harm but God meant it for Good." Every time we find ourselves in difficult circumstances, we are being tempted to believe in the lies of sensual appearances. All we need to do is "Be still, and know that I AM God..." We must always remember that God is present with us. If we are able to keep our faith in Infinite Intelligence, our faith will increase when we realize that circumstances have no power. It is how we react that matters. When we know that God, the source of infinite Good, is in charge of the universe, then we are no longer fooled by appearances. And we understand that everything that happens to us is for our own Good. But, you say, how can suffering, disease and poverty be Good? Suffering, disease and poverty are our teachers. We will continue to experience suffering, disease and poverty until we understand the Truth. We become free of suffering when we understand its cause. Disease, poverty and suffering are the result of selfishness, self-love,love of the world, ignorance, abuse and self-righteousness. When we understand what fear is, then we understand the meaning of faith. Like darkness, fear is nothing of itself; it is a lack. A lack of what? A lack of Being, Awareness, Love, Truth, Light. When we identify with our limited personal body and life story, we experience lack, want and fear. But when we realize that God is always present with us and caring for us, our fear dissolves in our Love for God and others. To have faith means to remain at the levels of spiritual Light and warmth no matter what happens to us. To have faith means to surrender to what is and to trust in Infinite Intelligence. If we stay at these enlightened spiritual levels, whatever happens can do us no harm. If we are ill, we will be able to heal. If we are poor, we will again attract wealth. To have faith is not to be fooled by appearances. To be afraid is to falsely believe that the sun died when it is cloudy. To have faith is to understand and rightly believe that the sun will always be there no matter how many times it is hidden by the clouds. Fear is escaping or running away from our emotions. Our suppressed and unconscious emotions are always knocking at the door of our mind and creating negative thoughts. To eliminate the fear, we must accept and feel the emotion and then release it. And the only way we can release these negative emotions is by understanding, repentance and forgiveness. We must understand that all human beings make mistakes. By repentance and forgiveness, we are liberated from the egotistical prison of self-righteousness. The reason we are fearful is because we desire security, control and approval in our life. But we are not in control of LIFE. INFINITE LIFE is in control of the whole universe. To let INFINITE LIFE do its wondrous work and heal our body and affairs, we must let go of desiring control, security and approval. We must surrender to the power of Infinite Intelligence and Love which knows all and heals all. WHICH IS A STATE OF INSTRUCTION FOR THOSE WHO ENTER HEAVEN. The third state of man after death, that is, of his spirit, is a state of instruction. This state is for those who enter heaven and become angels. It is not for those who enter hell, because such are incapable of being taught, and therefore their second state is also their third, ending in this, that they are wholly turned to their own love, thus to that infernal society which is in a like love. When this has been done they will and think from that love and as that love is infernal they will nothing but what is evil and think nothing but what is false; and in such thinking and willing they find their delights, because these belong to their love; and in consequence of this they reject everything good and true which they had previously adopted as serviceable to their love as means. Good spirits, on the other hand, are led from the second state into the third, which is the state of their preparation for heaven by means of instruction. For one can be prepared for heaven only by means of knowledges of good and truth, that is, only by means of instruction, since one can know what spiritual good and truth are, and what evil and falsity are, which are their opposites, only by being taught. One can learn in the world what civil and moral good and truth are, which are called justice and honesty, because there are civil laws in the world that teach what is just, and there is interaction with others whereby man learns to live in accordance with moral laws, all of which have relation to what is honest and right. But spiritual good and truth are learned from heaven, not from the world. They can be learned from the Word and from the doctrine of the church that is drawn from the Word and yet unless man in respect to his interiors which belong to his mind is in heaven spiritual good and truth cannot flow into his life; and man is in heaven when he both acknowledges the Divine and acts justly and honestly for the reason that he ought so to act because it is commanded in the Word. This is living justly and honestly for the sake of the Divine, and not for the sake of self and the world, as ends. But no one can so act until he has been taught, for example, that there is a God, that there is a heaven and a hell, that there is a life after death, that God ought to be loved supremely, and the neighbor as oneself, and that what is taught in the Word, ought to be believed because the Word is Divine. Without a knowledge and acknowledgment of these things man is unable to think spiritually; and if he has no thought about them he does not will them; for what a man does not know he cannot think, and what he does not think he cannot will. So it is when man wills these things that heaven flows into his life, that is, the Lord through heaven, for the Lord flows into the will and through the will into the thought, and through both into the life, and the whole life of man is from these. All this makes clear that spiritual good and truth are learned not from the world but from heaven, and that one can be prepared for heaven only by means of instruction. Due to the degradation of the Christian Church, many people today believe that they will be saved by faith no matter what they intend, say and do during their existence on earth. Our beliefs flow forth from what we love and intend. Yet some persons insist that they believe in God although they regularly transgress the laws of Heaven, continue to fulfill their selfish lusts and disregard the well-being of their neighbors. Are we to believe that we can live in sin during our whole life, say “I believe in God!” before our death and be saved? God may be merciful but Divine Justice consists of Mercy and Judgment. The substance of our spiritual body is gradually built by our intentions, beliefs and actions on earth. And, if we lived in sin, the substance of our spiritual body will surely consist of love of self, love of the world or love of abuses. After death, such a spiritual body will only experience Divine Love as an agonizing fire and Divine Truth as a blinding Light. It will then be necessary for us to flee into the darkness of hell. We think we live in a physical world. But the Truth is we live in a higher-dimensional universe, which includes being and consciousness. Therefore, it is important to make sure that what we believe is True but it is even more crucial to do the will of God through loving and useful works. This is our protection: our true beliefs, kind intentions and loving works. Then, even if we are faced with a pack of lions, they cannot hurt us because we have conquered the fear that is within ourselves.